My secret to having Crystal Moist skin in both Singapore and Korea! 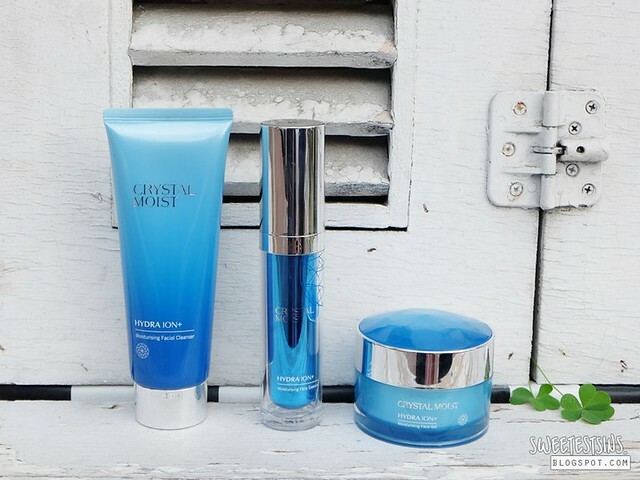 Crystal Moist, formulated and made in Korea combines properties unique to precious mineral complexes with powerful nutrients of Korean Deep Ocean Water. Rich in essential minerals, Korean Deep Ocean Water penetrates into skin, restoring moisture and comfort. Boosted by efficient moisturizing factor of Hyaluronic Acid, forms a hydrating veil on skin's surface and skin is primed to lock in water molecules to soothe and moisturize dehydrated skin. Derived from 5 fermented essential minerals, it replenishes essential trace elements for skin health, lifts skin's vigour and revives energy from within. Grown in subtropical zones such as Asia and Australia, the natural Lalang Grass Rhizome is extracted in France. Works together with Glycerin that acts as an efficient moisturizing factor to bring about long-lasting hydration. 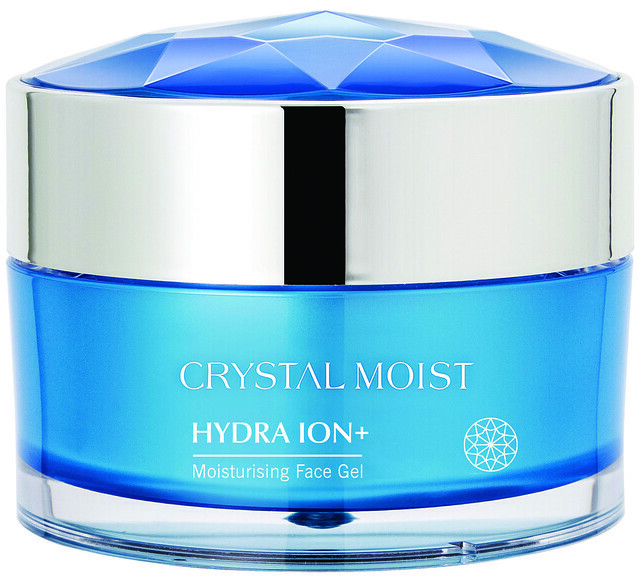 Crystal Moist Hydra Ion+ is formulated with seaweed extract to further improve skin hydration. Seaweed extract is rich in Polysaccharides and Fucoidan to soften and moisturize skin. It has a soothing effect on skin and acts as an antioxidant to protect skin against free radicals. High in essential minerals such as calcium, iodine and iron. I have been using Crystal Moist Hydra Ion+ products namely Crystal Moist Hydra Ion+ Moisturizing Facial Cleanser, Crystal Moist Hydra Ion+ Moisturizing Face Essence and Crystal Moist Hydra Ion+ Moisturizing Face Gel for a month and I thought its time that I share my thoughts on them with you! 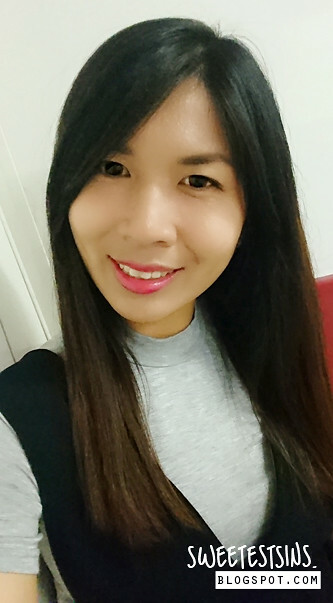 I even brought them along on my 10D9N Korea Trip and I'm pleased to say that I came back to Singapore without having dry flakes on my skin or skin peeling unlike how my skin would react normally when I travel to countries with dry climate. Gentle foaming cleanser that hydrates and soothes delicate skin with a Hydra-Clean Complex that adds extra moisture to skin during the cleansing experience. Crystal Moist Hydra Ion+ Moisturizing Facial Cleanser is gentle on the skin and does not make my skin feel tight after cleansing. It has a pleasant mild fragrance to it that isn't too overpowering. You won't need a lot of product, a little (pea size) goes a long way and is adequate for the entire face. I like how soft my skin feels after cleansing with Crystal Moist Hydra Ion+ Moisturizing Facial Cleanser! A silky soft essence that keeps skin supple and soft, densely restoring moisture to skin with Korean Deep Ocean Mineral Water. Moss Roses extract soothes skin to unveil crystal moist complexion. Continuous application perfectly hydrates skin to crystal moist complexion. There is no doubt why Crystal Moist Hydra Ion+ Moisturizing Face Essence is one of Ju Eun-Young, Crystal Moist Brand Ambassador from Korean Girl Group TWO X. Personally, I have been using Crystal Moist Hydra Ion+ Moisturizing Face Essence both day and night and I'm adding it to my list of holy grail products! Let me fill you it on why I love it so much - first, it has a light texture that absorbs into skin quickly which allows me to apply sunblock and makeup in a jiffy especially during morning rush hour! On top of that, Crystal Moist Hydra Ion+ Moisturizing Face Essence helps to hydrate my skin to create a smooth canvas prior to makeup application. Best of all, it doesn't feel sticky after application! A light refreshing face gel that supplies long-lasting moisture to skin, giving it a healthy glow. Enriched with Camellia Japonica Seed Oil, it delivers antioxidants to improve skin conditions. The Perfect Hydration 24 Complex forms a protective layer on skin to reduce water loss. I'm a fan of gel moisturizers and Crystal Moist Hydra Ion+ Moisturizing Face Gel didn't disappoint. For those of you whom are familiar with Laneige Water Sleeping Pack, the texture of Crystal Moist Hydra Ion+ Moisturizing Face Gel is rather similar, albeit slightly lighter. Personally, I only apply Crystal Moist Hydra Ion+ Moisturizing Face Gel at night after cleansing, toning and applying Crystal Moist Hydra Ion+ Moisturizing Face Essence. I usually apply a thick layer of Crystal Moist Hydra Ion+ Moisturizing Face Gel so as to seal the goodness in. What I like best about Crystal Moist Hydra Ion+ Moisturizing Face Gel is that after application, I wake up to having plumped skin the day after! The high affinity facial mask created from the fibre TENCEL, containing a vital moisturizing mineral essence with intense hydrating property for an intensive hydrating treatment. With Bird's Nest extract to improve skin's elasticity and fits well on face contours to provide a crystal-moist complexion. 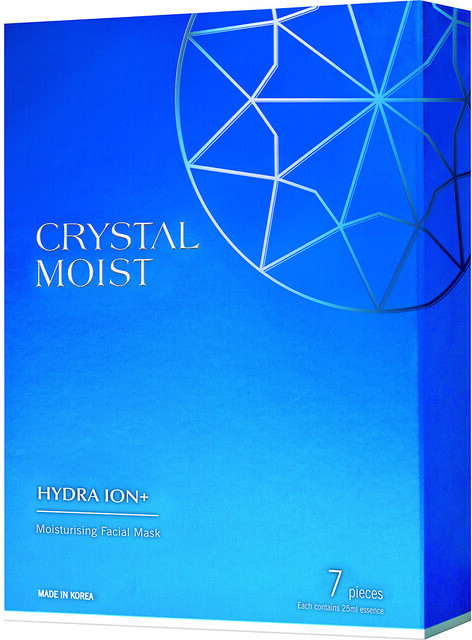 Also one of Ju Eun-Young's favourite product from Crystal Moist Hydra Ion+ product line, Crystal Moist Hydra Ion+ Moisturizing Face Mask makes my skin feel softer and more moisturized after application. Lightweight colour correcting cream that evens skin tone and supports radiant-looking complexion. With UVA and UVB protection for daily use and helps prevent signs of ageing caused by UV damage. Contains Sea Shine from France and Floral-Bright Complex to enhance skintone and help reduce appearance of dark spots. Primes skin for makeup application. I like how Crystal Moist Bright Ion+ Brightening CC Cream SPF 36 PA+++ is easy to blend and how it blends well with my tanned skin tone. In terms of coverage, Crystal Moist Bright Ion+ Brightening CC Cream SPF 36 PA+++ has light to medium coverage depending on the type of application which I think is more than adequate for daily wear. They all work but I prefer using a stippling brush for lighter coverage and BB cushion sponge for more coverage without the mess. Did I mention that Ju Eun Young would never fail to apply Crystal Moist Hydra Ion+ Moisturizing Face Essence and Crystal Moist Bright Ion+ Brightening CC Cream SPF 36 PA+++ before heading out no matter how hectic her schedule is?